There are many classes that can be taught from this book. While the book is about indigo, many of the quilt projects could be made from a variety of fat quarters with great results. 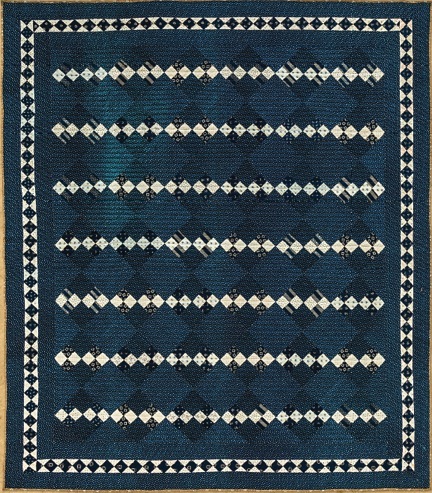 Several different small class-sample quilts could be created in various styles. No matter the specialty of your shop, the projects contained in the book are likely a good fit. Styles could range from Modern to Prairie, Asian to African. If you happen to carry specialty indigo fabrics such as those from South Africa or Japan, the class would provide an incentive for customers to give these distinctive textiles a try without a big commitment. The 5 projects in the book are all constructed of repetitive patterns, so they are easy to scale up or down by changing the number of blocks or appliqués. When teaching, different projects offer opportunities to teach a variety of techniques. For example, the projects use Seminole piecing, strip piecing, appliqueé, reverse appliqué, and cutwork techniques. A class could be taught for each technique. The emphasis of this 6-hour beginning class is to teach the basics of rotary cutting, strip piecing by machine, and Seminole piecing. By reducing the number of blocks, you can make a quilt top that can be made in the class. By increasing the number of blocks, students could expand to a king-size quilt. Students will learn how to do the math involved in setting blocks on point and how to do a simple but graphic border which can easily be reduced or expanded to any size. The pattern is easy enough for beginner classes but could emphasize color dynamics and fabric choice for more advanced quilters. If your students are true beginners, additional classes could be scheduled to teach four-patch construction, setting the quilt together, and finishing the edge. The class could also feature a four-patch block exchange to get a variety of fabrics. 1. Make strips for four-patches. 3. Demonstrate how to use rotary cutter and ruler and how to press seams. 4. Cut larger strips for double four-patches. 5. Teach butting seams together and squaring up. 6. Show how to cut setting pieces and work with biases. 7. Practice techniques just learned, but using Seminole piecing instead. 8. Demonstrate assembly and finishing the quilt.